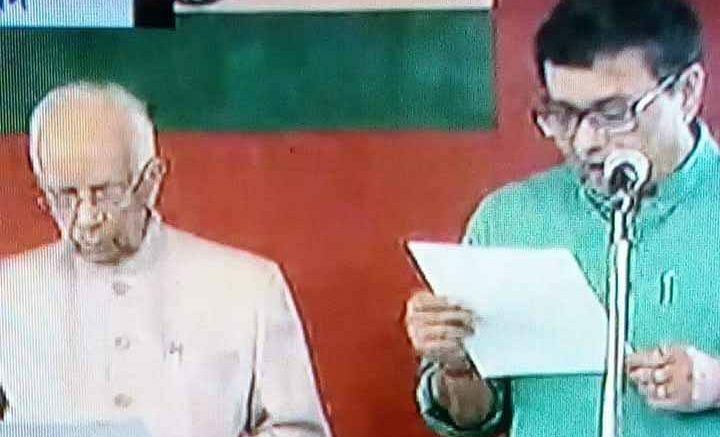 Kolkata, May 15: Nadia district Trinamul Congress president Ujjwal Biswas today inducted as a new minister to Mamata Banerjee’s cabinet along with party MLA Chandrima Bhattacharyay. Both the MLAs were sworn in today by Governor Kesharinath Tripathy at a small programme held in Raj Bhawan in morning. Biswas has been assigned the charges of state correctional services department replacing Abani Mohan Joardar who is relieved of the charges due to illness. Chandrima Bhattacharyay would lookafter independent charges of eGovernance department. Chief minister Mamata Banerjee was present during the swearing in ceremony. With induction of these two new faces, the number of ministers in Mamata Banerjee’s cabinet increased to 44. In the first Trinamul ministry Ujjwal Biswas was given the charges of technical education department.